After a succession of releases for the Doppler label, hardware deviant Jacksonville lands on Inner Shift along the likes of Gene Hunt, Brad P and Rai Scott. 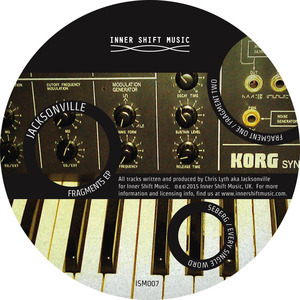 Much like Korg MS-20 pictured on the EP's artwork, "Fragment One" and "Fragment Two" are two techno mutants; a pair of fuzzy bass growlers with an outsider flavour to their arrangements. "Seberg" is straighter and laced with less intoxicants but is nonetheless freaky, and "Every Single Word" chugs its way across distant vocal samples, bric-a-brac kick patters and an inherently funked-out flavour. Recommended!